Love this place. Its often not busy in the evening so if you like things like not queuing, a decent enough selection of beers including guest ale, and a lack of noisy City-types, this is ideal. Also has an excellent jukebox featuring Bowie, Floyd, Dylan etc (free!) and very nice bar staff. Also does a good selection of food although I haven't tried anything other than the chips! 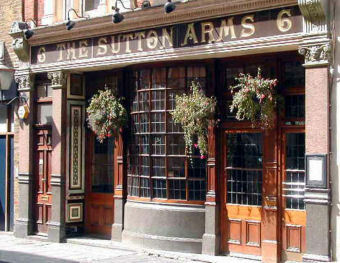 Popped in for a beer based on the positive ratings in BITE, and not disappointed - a nice little pub, with decent pint of Fullers and a good guest beer. However, the place was dead by 7pm - for a Tuesday night in central London, this was a bit of a surprise, and unfortunate, as with a bit more atmosphere, I could have happily spent the evening. 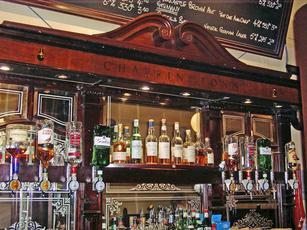 This pub is now under new management - Kiwi Chris has left. Nothing else seems to have changed though; still very good (Fullers) beer and still very cr*ppy sound system ! 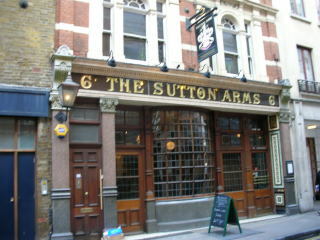 Still, I like it, and prefer it to the blue-neon-lit Bacardi-Breezer shop next door. "On the wall opposite the bar are, most notably, three plaster busts of what are presumably famous people, although I didn't recognise any of them. Typically for London, and presumably to appease the PC lobby, one of the three busts features a black man"
Speaks volumes - its Othello. The other two are also characters from Shakespeare. 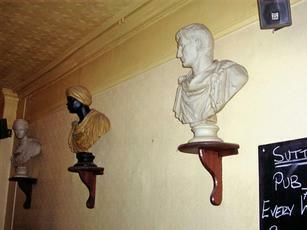 The busts have survived at least one refurbishment and have been there for at least 30 years that I know of. They therefore predate the PC lobby. On that basis I wouldn't trust the rest of the review either. Very old fasioned pub with some good local Ales. The Cat Charles is a bit of a bloody pain though!